The original (1968), Planet of the Apes defined an era and launched one of thee most successful franchises. Unfortunately some of the sequels were just plain horrible, and the reboot in 2001, which featured Mark Wahlberg was by nowhere near the original masterpiece either. 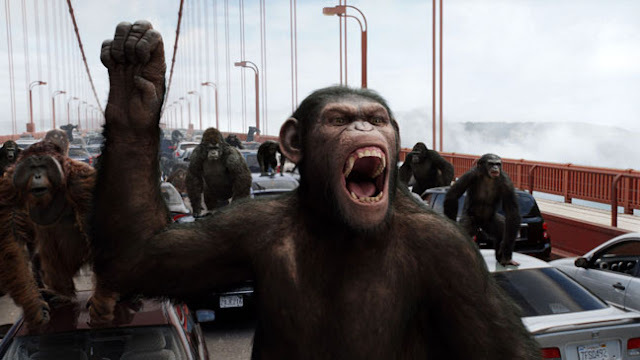 But then comes Rise of the Planet of the Apes, when all hope was lost for this films’ franchise, this new film re-defines it and it does this brilliantly!!! In a time where Hollywood seems to want to make an origin story for any successful franchise, this normally ends up to be an epic fail. There are a few exceptions that normally revitalize the franchise, in cases such as X-Men: First Class and Batman Begins, ‘Rise of the Apes’ would also be one of those exceptions!! The film is wonderfully crafted, well thought-out and a quite an emotionally involved film. ‘Rise of the Apes’ really got the story right for this film. Director Rupert Wyatt developed Cesar (The Protagonist - Ape) story so well throughout the film. So much time was taken for the pure purpose of developing Cesar’s character and to get the audience understand why he does what he does, because of all the ups and downs he goes through in his life. Cesar was portrayed to perfection by Andy Serkis, who we think should definitely be in the running for an Academy Award for his portrayal of the revolutionary ape! One thing we liked about this film is that instead of going for a whole lot of pointless action, and hundreds of hints for possible sequels, to extend the film, the majority of the film is simply used to get into the apes mind and get totally submerged into the character of this ape. Wyatt did something brilliant by just focusing on the film in hand and developing Cesar as a character in this film, from the amazingly intelligent “pet”, to a strong powerful revolutionist leader. This is what makes the film so great. Another aspect of the film that we loved was seeing how the apes communicate with each other. This was an ingenious move by Wyatt as it pulls you entirely into the film. You have to watch closely and look at there facial expressions, movement, and body language to understand fully what’s going on. On performances, James Franco does a decent job of keeping the audience drawn in the film. However, in a film that is filled with the most mesmerizing CG apes, it would be hard for any actor to try and out shine them. 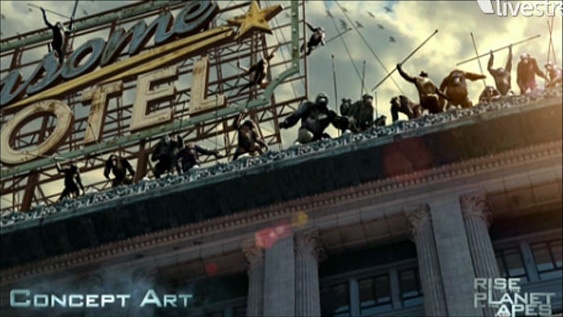 The apes in the film is truly amazing and if you didn’t know any better you would of thought that they actually used real apes for some scenes. They really steel every scene that they are in. All the stars in the film are easily over-shadowed by there CG co-stars. This story was also quite heart felt that was something that was quite unexpected. There are some scenes that really do tug on some emotions. Caesar will scream his way into your heart!! But in the end, it is a real fun action film, that will get you get you cheering the apes on even though you supposed to be supporting your own kind… the unworthy Humans!!! Rise of the Planet of the Apes is a fantastic film and probably on of thee best films of the year. The film is definitely something that is truly great, and earned its place right next to the original Planet of the Apes. But the greatest feat of the this film would have to be its ability to tell a human story of an ape, that not only will launch a whole new franchise but re-defined the franchise as well.